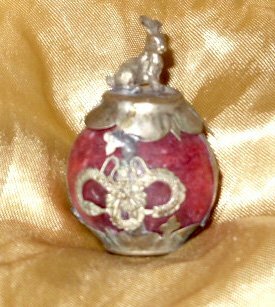 Beautiful red jade and silver Sphere featuring the Chinese Year of the Rabbit/Hare. This item measures 5” around and stands 2” tall. One side is a Phoenix and the other contains the protective dragon. Persons born in the Year of the Hare are talented and ambitious. They are popular with anybody and good entertainers which often makes them the center of attention. Even though they are liked they are rather pessimistic, insecure and are afraid of changes. They almost never lose their temper and are very good-natured. In the business world however they are smart and make the right decisions according to instinct. Nevertheless they are no gamblers. Hares are known for their sense of art and for that reason often have beautiful homes. They match persons born in the Year of the Sheep, Pig or Dog.